The Internet Society in conjunction with Packet Clearing House (PCH), our Kyrgyzstan Chapter (ISOC-KG) and the CAREN Project organised a BGP and Peering capacity building workshop on 3-7 September 2018 in Bishkek, Kyrgyzstan. 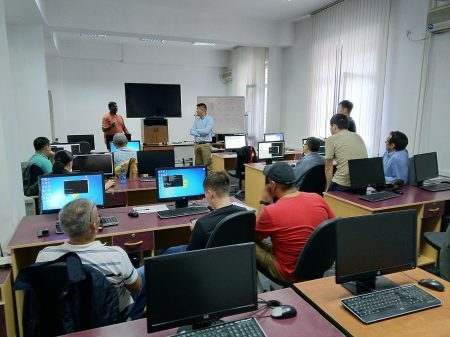 This five-day workshop was aimed at training engineers for the existing KG-IX Internet Exchange in the capital Bishkek, but also for the prospective Ferghana Valley Internet Exchange being established in the southern city of Osh. The workshop was led by Nishal Goburdhan who’s an Internet Analyst at PCH, a non-profit organisation that builds and support IXPs around the world. He was assisted by myself (Kevin Meynell), with the workshop being hosted by the National Academy of Sciences of the Republic of Kyrgyzstan. The workshop was comprised of a mix of lectures and hands-on lab work to teach the skills required for interconnecting networks on the Internet, and participating in an Internet Exchange. It commenced with Internet address planning using both IPv4 and IPv6, followed by setting-up OSPF on different internal networks, then interconnecting those using BGP and applying routing policy and filtering. The workshop concluded with how to set-up an IXP and discuss current best practices for peering. Twelve participants attended the workshop, drawn from the incumbent telco Kyrgyz Telecom, KG-IX, commercial ISPs, universities, and KRENA (the National Research and Education Network). Despite limited previous experience and some difficulties in communicating between English, Russian and Kyrgyz languages (although we had an excellent translator), the group proved very adept at picking-up what needed to be done, cooperating as a team, and completing the tasks. 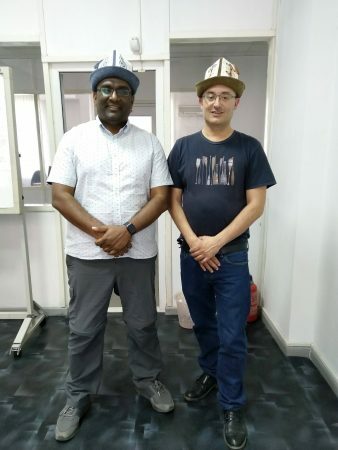 It was also extremely encouraging that although none of the participants had any previous IPv6 experience, they were keen to learn how to set-up and manage IPv6 networks which will be critical for the future development of the Internet in Kyrgyzstan. KG-IX has greatly improved performance and reduced the cost of Internet access in Kyrgyzstan, but this has mostly benefitted Internet users in the capital Bishkek and northern part of Kyrgyzstan. The Ferghana Valley in the south part of the country also has a substantial population, yet has poor access to communication services and users typically pay more than five times for the same bandwidth as in Bishkek. Establishment of the Ferghana Valley Internet Exchange Point (FVIXP) is therefore extremely important for improving connectivity in the region, particularly with respect to reducing costs. This open and neutral exchange, supported by the Internet Society, is planned to be built in Osh, but will also need network engineers to support it which was one of the motivations for organising a capacity building workshop to develop the necessary skills. The Internet Society would like to thank the Internet Society Kyrgyzstan Chapter, the National Academy of Sciences of the Republic of Kyrgyzstan, Nishal Goburdhan and Packet Clearing House, and the EU-funded CAREN Project for their support of this workshop.